Brief Synopsis – During the Washing DC housing crisis of World War II, an elderly bachelor tries to play matchmaker for his two younger roommates. My Take on it – This is a film that I knew absolutely nothing about before watching it besides the fact that it was one of the films nominated for Best Picture that year. It actually starts off amazingly and I was so excited to see if they could keep that level of entertainment throughout…. unfortunately, they couldn’t. 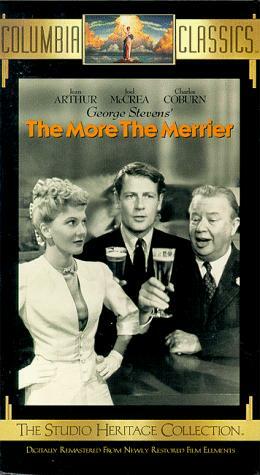 Charles Coburn is amazing in this film and he plays his character with so much energy which seems so out of place based on his age, but it works so well. He went on to win an Oscar for Best Supporting Actor for this role and really deserved it. The early scenes of this film are written so well and they are able to give us dialogue and actions by the characters that works so well and are fun to watch as they rapidly move in front of us. The energy and excitement of it all tapers off about the midway point and then the film turns into a typical Rom-Com of that era which is still good, but not as grand as it originally seems to be. I can definitely understand how this film could garner a Best Picture Nomination that year, but it still isn’t strong enough to have been a real contender in that category. Bottom Line – Starts off amazingly, but tapers off as things move along. Coburn is amazing and deservingly won an Oscar for Best Supporting actor for this role. Loved the way that the early scenes are written because the dialogue and actions of the characters are so much fun to watch as things rapidly move along. I can understand how this film could have been nominated for Best Picture that year, but in the end it’s a fun romantic comedy of the 40’s, but not the kind of film that would have been able to walk away with the big award. Recommended! This is a favorite of mine. All the way through. Coburn’s impish performance steals the show, but Jean Arthur is wonderful. Joel McCrea might be a bit on the low key side for me – but with everything else going on and all the wonderful character actors populating the movie – I guess he can afford to be. The slow burn love story – orchestrated by Kanin’s script, George Steven’s direction and Coburn’s wily character – is a delight. The sharing of the bathroom, the rainstorm on the rooftop, the kid thinking they’re spies witth the binoculars, “damn the torpedoes – full speed ahead” – all of it works for me – and I’ve probably seen this movie at least a half dozen times. As for some trivia – the film was remade (and not all that great IMO) – using the backdrop of the Tokyo Olympics and the housing shortage it caused to substitute for the WW II wartime housing crunch in Washington, DC – as “Walk, Don’t Run” which turned out to be Cary Grant’s final starring role before he retired from acting. Believe it or not – he played the James Coburn role in that one.